http://asusindia.co.in/T100/ technology on the move has given me a sense of liberation, from the narrow walls of domesticity to the wide vista where the world is my workstation. Into that heaven of freedom , techonology has let my life arise.– with thanks and apologises to Gurudev Rabindranath Tagore. Technology is has really liberated me, and added hours to my day. One greatest advantage to me, is freedom From Bound Office Space. In early 2000 I was single parenting that meant, I dropped one kid to school waited an hour on the road to drop the next one, because coming back made no sense, but that one hour set me back work wise. In turn this made me resentful. 2014 when I have wait to pick my daughter up, I am absolutely at peace with my notebook, I am working on my article, or reading on my kindle. There are times when I have done quick consultations too. In between patients I researched or wrote, that meant elaborate filing methods. Waiting at an utility office meant loss of working time. Of course I did compensate by carrying a storybook. Travelling out station meant dissociation from workspace. Technology has meant that my library be it reference or relaxation is a tap away. Technology on the move means I can function better in my various roles I can honour my family responsibility without it interfering with my work. When my trips are planned, I give my appointments accordingly instead of clinical work, I give the counselling appointments. I schedule my reading work, or create my lecture notes, My travel to Manipal or Bombay is as productive as I choose it be without lack of office equipment limiting me. When my mother-in-law visited us, we hooked her on Skype to a puja happening in her sister’s house she was so taken up with it that I actually got her an internet account. Technology on the move has let us travel our roads, at our pace and document things on the spot. Many a times when we ask for directions to a destinations it is almost as if someone asks you to take a streetcar named desire, transfer to one called cemetery ride six blocks away and get off Elysian fields. Map my road is a great application to work with. The last road trip we tracked our travel, spotted the restaurants, and just drove down. Technology on the move has allowed me connect with people as we travel, long train travel, I usually have either of my daughters or my mother for company despite say being 300km apart, be it Wassup , or Skype. Sometimes if nothing I just turn on some soothing music, and have a good snooze. I don’t know about T100, but here is something that I came across as I was researching to buy a new netbook, Asus has just announced its new product. Windows 2-in-1 laptop with a detachable android phone. For a techno-illiterate like me it sounds great. It’s a 12.5 inch tablet/laptop hybrid that has a 8.1 brain, (please don’t ask me to elaborate, as far as go, Einstein’s 12 something weighing brain was awesome with 8.1 we are getting closer.) it runs on a Intel core architecture. when docked the phone’s android interface is displayed within windows 8,it also be switched to full android tablet interface. In effect it gives 5 modes, a windows tablet, a windows laptop, and android phone , an android tablet and an android laptop this gives it the name Transformer Book V (pronounced five) . 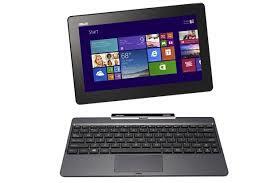 the tablet weighs about 0.8 kg, 12.5 inch HD IPS display, 4GB RAM and 28 Wh battery. It claims to allow 10 hrs of web browsing. The packs a flash storage space of 128 GB, that works alongside with a 7mm hard drive up to 1TB in the battery less keyboard. I am not sure when we can actually buy it. hope it is long enough for me to understand what all the information written on the brochure means. Next PostNext Over the Amona Bridge.